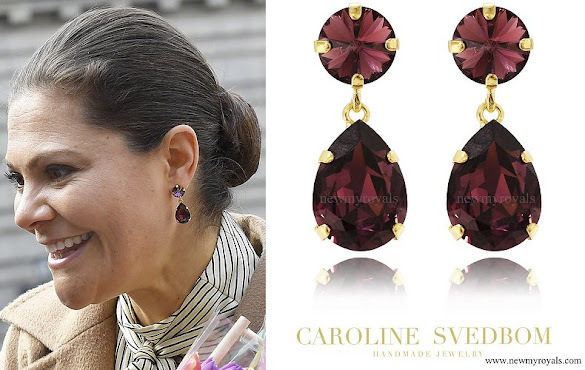 Amazing it always worms my heart seeing them i love sweden but i dont live in sweden i live in the uk and i love sweden royals very much. There are some girls/women who have sensory issues and cannot bear the feel of loose hair. But she wore it loose when she was young, so who knows. Nice to see them again anyway! Yes, you are right, i cannot bear the feeling of loose hair! I hate it. When i have long hair i always wear i like Victoria, my husband hates that too ha ha. Heather; just like that. I have long hair what I love in every other aspect than loose hair sticking to my face, so I never wear my hair loose. I get almost nausea if hair get to my face. I don't think she looks 'blah' at all, she looks great, the outfit is perfect for the occasion, I even like the bow blouse here, she has a great posture and is a majestic appearance. It is her choice, we should respect it. 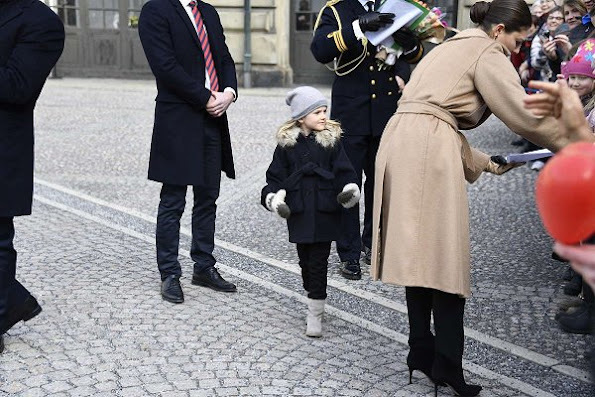 At least her hair is always groomed and kempt and I think with the Cashmere coat and the bow blouse the bun makes for a good classic look. I guess I stand corrected, but 'loose' doesn't have to mean long or flying in one's face, there are bands, after all. I agree about the hair, Beth. It is more tidy and cozy to have a bun. I just think that the sleeves are little too long. Everything else is ok.
No wonder she's so popular! She looks lovely. This is such a beautiful family and I adore the little boots their son is wearing. So cute. Nice. The kids looked very warm with they're winter clothes. Lovely! Princess Estelle and Prince Oskar are so adorable. 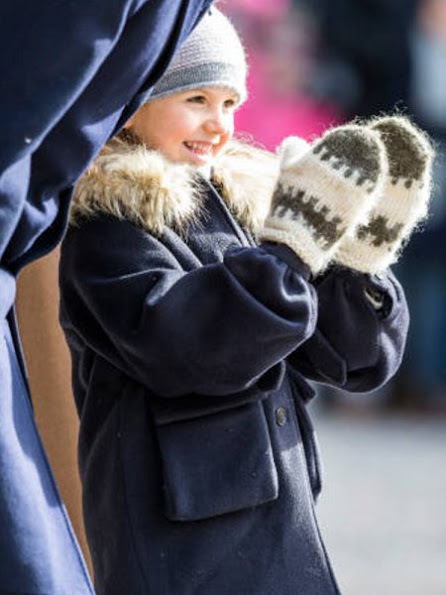 Princess Victoria has beautiful smile . Very often a smile on the face is the prettiest thing you can wear. Beautiful family. Lovely Estelle and Oscar. I am glad to see them grow. 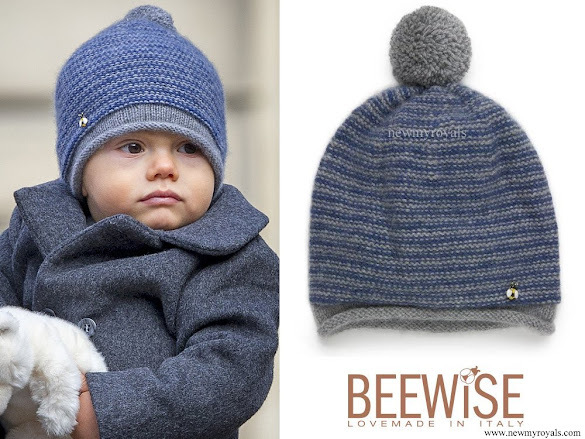 Estelle and Oscar are very handsome children and well-behaved. Their father seems always to be much involved and caring for them. I think Princess Victoria chose a perfect husband for her. 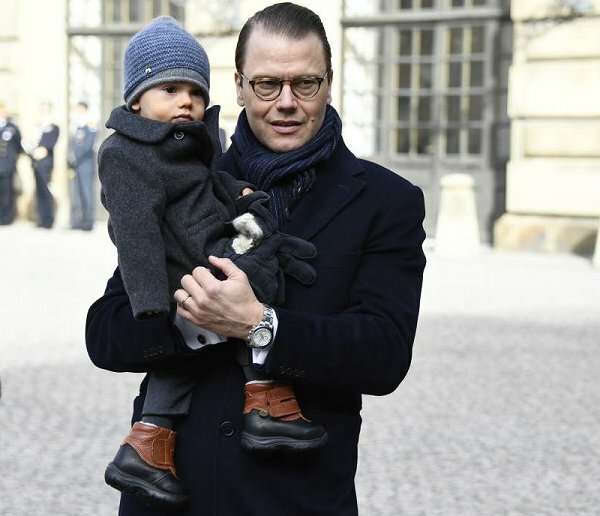 I met Prince Daniel this week. I have to say I was surprised he was so normal. No royal behaviour at all. But he was very polite of course. 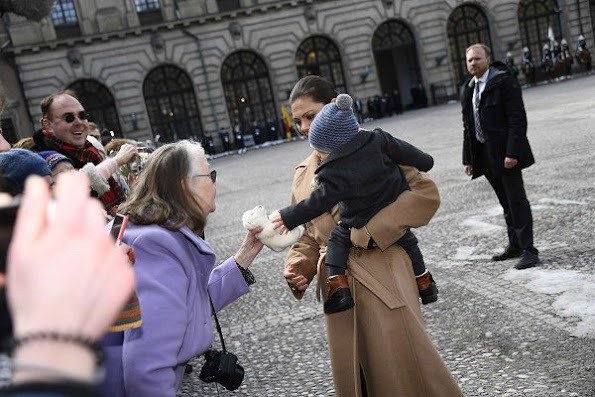 Victoria looks lovely, and so do the children. 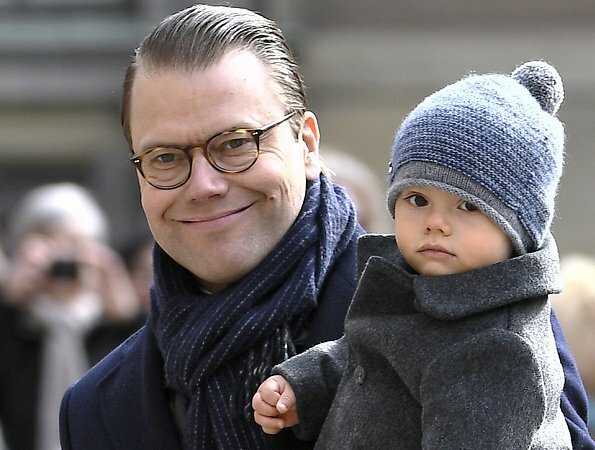 Not being critical, however, Prince Daniel doesn't look very well. Hope all is okay, they are such a lovely family. 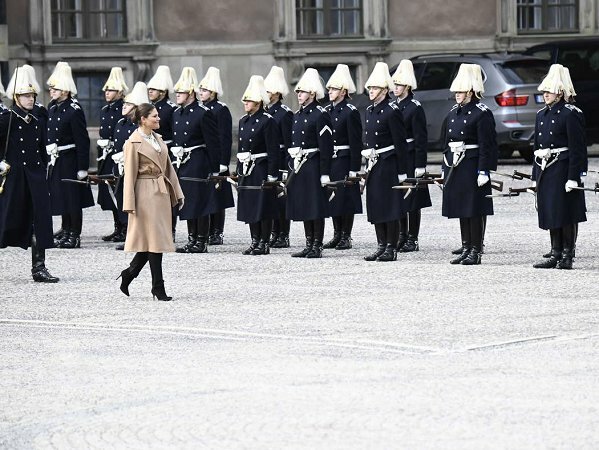 Kronprinzessin Victoria hat sich für die Gratulanten hübsch gemacht. Der Mantel wird nie aus der Mode kommen und vielleicht sogar an Estelle vererbt!. Dazu die schöne Schluppenbluse und eine schöne schwarze Stoffhose. Eine Kombi, die immer geht! 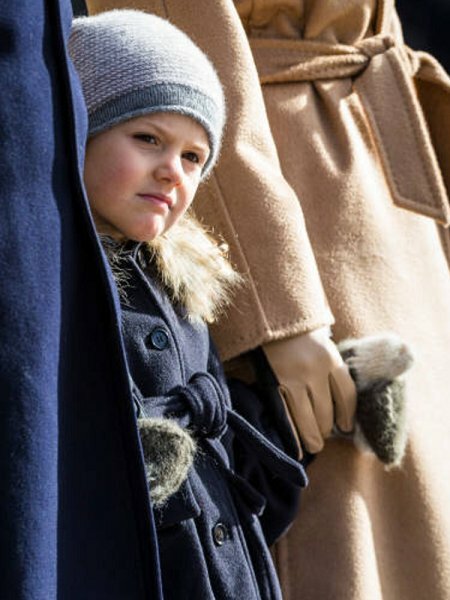 Das Tüpfelchen-auf-dem-I wären fast die Killer-High-Heels geworden (in denen sich die Kronprinzessin mit schlafwandlerischer Sicherheit auf dem tückischen Stockholmer Kopfsteinpflaster bewegte!) Aber natürlich waren es dann doch Estelle (so eine Brave!) und Oscar, der wächst und gedeiht und der Papa. Eine herzliche, freundliche und warme Familie - und eine schicke noch dazu!